High frame rate welding cameras enable humans to view the welding process in incredible detail because they capture and distill welding phenomena like droplet detachment and defect formation. The Canadian Centre for Welding and Joining offers a great online selection of videos made with two models of Phantom camera. For example, see the mesmerizing video below of GMAW of steel showing globular transfer captured at 3000fps. While high frame rate welding cameras produce amazing images of welding, they generate huge amounts of data. The practical data limit results in a tradeoff between resolution and frame rate. Generally, the higher the frames-per-second, the lower the resolution and vice versa (though the boundary is continually changing with Mr Moore and camera interfaces). Also keep in mind that higher speeds mean shorter weld durations – you might only get to record 2 seconds of welding at the highest speed due to the size of the on-board memory. Most high frame rate welding cameras will let you select where along the frame rate vs. resolution continuum you wish to record. 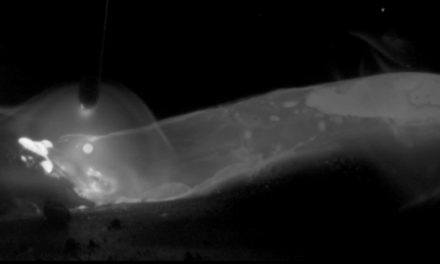 For example, the above video of MIG welding was made with a Photron camera at 10,000 fps and 640×744 pixels resolution. When it comes to high speed, how fast is fast enough? It’s possible to record welds at 10,000+ or even 100,000+ fps, but for most applications, 1000-2000 frames per second will allow you to playback the recorded weld in sufficient detail for process parameter development or troubleshooting purposes. If you are looking for a welding camera that captures video at higher than 30 frames per second (our typical monitoring camera speeds), feel free to contact us for free advice on selecting a camera system and determining the appropriate frame rate and resolution for your application. We can offer you the MeltView SYNC, a unique high-speed camera that overcomes the two main hurdles of high-speed imaging of welding: limited on-board recording space and camera bulk too large to fit on a welding robots.